Deaths resulting from blunt force trauma are some of the most common cases encountered by the practicing forensic pathologist. Whereas other forms of traumatic death (eg, gunshot wounds, sharp force injuries) occur under a relatively limited number of circumstances, deaths resulting from blunt force trauma occur in a variety of scenarios. For instance, almost all transportation fatalities — including those involving motor vehicle collisions, pedestrians being struck by vehicles, airplane crashes, and boating incidents — result from blunt force trauma. Other deaths resulting from blunt force trauma involve jumping or falling from heights, blast injuries, and being struck by a firm object, such as a fist, crowbar, bat, or ball. Bite wounds and chop injuries may be considered variants of blunt force trauma, sharp force trauma, or a class of injuries untothemselves. Blunt force trauma is routinely involved in cases classified as accidents, as well as in cases of suicide and homicide. People dying natural deaths often have minor blunt force injuries that do not contribute to death -- small abrasions or contusions on the skin are commonplace at autopsy. Although it is important to document evidence of blunt force trauma in all autopsies, one should not immediately assume that blunt force trauma is the cause of death. For purposes of death certification, it should be noted that blunt force trauma may be the underlying (proximate) cause of death in cases in which the immediate cause of death is a natural disease process. For example, individuals may die of infections, thromboemboli, or organ failure that occurs as a delayed result of previous blunt force trauma. In some cases, the injury may have occurred many years before death. It is important to understand that the designated manner of death in such scenarios must include the causal factor that made the decedent susceptible to the disease state, namely the underlying injury which initiated the chain of events ultimately leading to death. For example, the cause of death of an individual who dies of pneumonia after being hospitalized for several days for treatment of blunt force injuries following a motor vehicle collision should be certified as "acute bronchopneumonia complicating blunt force injuries due to a motor vehicle accident." The manner of death should then be certified as "accident." This chapter focuses on the cutaneous manifestations of blunt force injury. Other chapters will expand on topics such as closed head injuries, including sequelae of rapid acceleration/deceleration. Equally important, however, are the characteristics of the blunt object and the surface that is impacted. Impacts involving a large surface area -- either with regard to the impacting object or with regard to the tissues being impacted -- will result in a greater dispersion of energy over a larger area and less injury to the impacted tissues. For example, a thin metal pipe striking some part of the body would be expected to inflict greater localized injuries than a broad board of similar mass and velocity striking the same part of the body. Likewise, an impact on a small area of a curved surface, such as the head, will cause greater damage than would be caused were that same impact to occur on a flat surface, such as the back, since there will be a more concentrated point of impact on the head. The composition, or plasticity, of the tissues impacted also affects the resultant injuries. For example, a person who is kicked in the chest may have only minimal injuries to the elastic skin surface, whereas deeper, more solid tissues such as ribs and internal organs (notably, the spleen and liver) may experience fractures and lacerations. Yet another factor affecting the severity of blunt force injuries is the amount of time the body and the impacting object are in contact. A longer period of contact allows kinetic energy to be dissipated over a prolonged period, resulting in less damage to the tissues than an equally forceful impact with dispersion of energy over a brief period. Contusion (bruise): Hemorrhage into the dermis, subcutaneous tissues, deep soft tissues, and internal organs as a result of rupture of blood vessels following impact with a blunt object or surface (as shown below). Two contusions on the skin of the chest. A contusion on the arm. 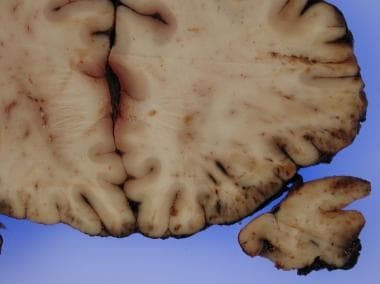 Cross section of brain with cerebral contusions on the inferior surface. Laceration: A bursting of the skin or other tissues resulting from compression or stretching associated with impact by a blunt object or surface (see the following images). Two abraded lacerations on the forehead. A laceration near the vertex of the scalp. Avulsion: A more severe form of laceration in which the soft tissues, musculature, and/or bone are torn away from the normal points of attachment (as seen in the image below). 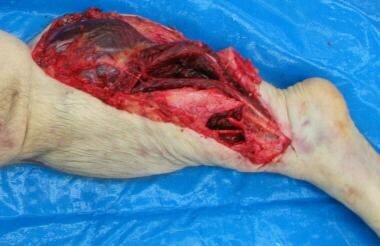 Avulsion of the right leg. Fracture: A break, rupture, or separation of tissue (most often bone) resulting from an impact (see the following image). Extensive fractures involving the base of skull. These injuries are often seen in combination with one another. 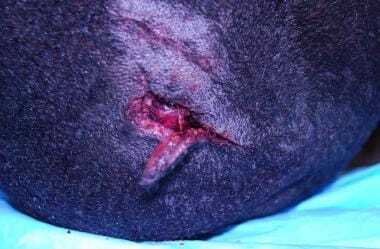 For example, abrasions are often found at the margins of lacerations. Abrasions, lacerations, and contusions are often noted adjacent to fractures. As with most types of traumatic deaths, scene findings often play an important role in the death investigation process. Examples include blood spatter evaluation and DNA analysis in homicide cases involving multiple blows with a blunt object, such as a baseball bat, and scene reconstruction following motor vehicle collisions. 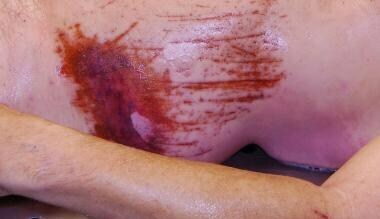 In certain cases, it may be helpful to examine the skin surface and wounds for trace evidence. This may involve looking for paint, metal, or glass fragments on a body that was struck by a hit-and-run motor vehicle; identifying embedded fragments of a weapon used to assault someone; or identifying a tool mark left in a bone underlying a blunt force impact site. Such trace evidence may be used by forensic science technicians to help identify the vehicle or weapon that caused the injuries. The individual types of blunt force trauma discussed above do not always occur individually; they often occur in combination. That is, one may encounter abraded contusions, abraded lacerations, and lacerated contusions (as depicted in the images below). 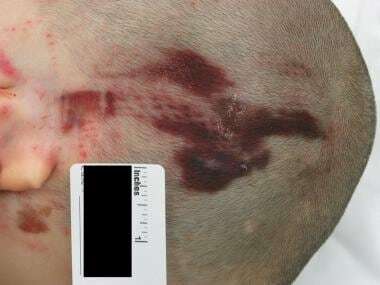 The appearance of a blunt force injury is determined by several variables, including the impacting weapon or surface, the anatomic site impacted, and individual factors including skin elasticity and coagulability status. Abraded contusion on the back. Brush-burn type abrasion on the left flank. In some cases, a patterned abrasion or contusion may result when an object impacts the skin. Whereas nonspecific blunt force injuries provide no hint as to what may have caused them, a patterned abrasion or contusion recapitulates some features of the impacting object. Such patterns may be of importance in identifying a weapon used in an assault or in identifying a tire or other part of a vehicle that strikes a body during a hit-and-run collision. In such scenarios, it is advisable to take photographs with a scaled ruler to help identify the object (see the images below). Overlaying the injury with plastic wrap and tracing it with a pen can also provide useful documentation. Patterned abrasion on the head due to impact by a motor vehicle. Patterned abrasion on the flank inflicted by a crowbar. Chop injuries are sometimes regarded as a variant of blunt force trauma. These injuries result from impact of the skin by a heavy object with a somewhat sharp facet, causing a wound that has attributes of both sharp force and blunt force trauma. Depending on how sharp the weapon is, these may resemble either gaping lacerations or large cuts with marginal abrasion and are often associated with underlying fractures. Objects that commonly cause chop injuries include axes, propellers, and lawnmower blades (as shown in the image below). Several chop injuries inflicted by a boat propeller. Finally, one must know that the degree of blunt trauma evidenced on the surface of the skin may not be indicative of the degree of underlying injuries or the cause of death. [1, 2, 3, 4] Severe, deep scalp lacerations may overlie a skull free of fractures, brain injuries, or hemorrhages. Alternatively, a child may have little or no evidence of injury on the skin, yet have devastating internal injuries. Commotio cordis, a sudden cardiac arrhythmia caused by blunt impact to the chest -- often by a ball, steering wheel, or some other object -- is another type of blunt force injury. The object may leave a patterned injury or there may be no evidence of injury at all, in which case, one would need to rely on scene investigation, witness statements, and other sources to determine the cause of death. In most instances, a review of the medical record and a standard, complete autopsy are all that is necessary to document significant blunt force injuries; however, certain cases may call for more specialized dissections. Among such cases are those involving blunt force injuries of the neck. 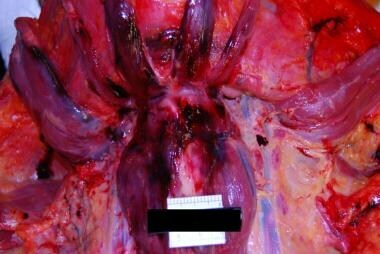 If a compressive, crushing force was thought to impact the neck, it may be advisable to perform a layer-by-layer anterior neck dissection, by which hemorrhage may be identified in the individual strap muscles (as seen in the image below). Once the muscles are dissected away, the cartilages of the trachea and the hyoid bone should be examined for fractures. After the dissection is complete, the neck organs should be removed so that the anterior cervical spine may be examined. If hemorrhage or fractures are noted, one may choose to remove and examine the spinal cord in order to document any pertinent injuries. Anterior neck dissection demonstrating hemorrhage within several strap muscles. In other scenarios, particularly motor vehicle related fatalities with nonlethal injuries documented by routine autopsy, a posterior neck dissection may be required to document the cause of death. In this procedure, a linear, vertical incision is made from the mid occiput to the upper spine. The soft tissues are then dissected away, so that the deep muscles, ligaments, and cervical vertebrae can be examined for injuries. At this point, the spinal cord may be removed from the posterior aspect and examined for injury. In cases in which cervical subluxation is suspected, the brainstem should be initially sectioned in the sagittal midline to identify subtle pontomedullary lacerations. Special dissections may be required to thoroughly document blunt force trauma in children in which there is suspicion of abuse. One such dissection involves stripping the parietal pleura from the pleural cavities after all thoracic organs have been removed. Although some rib fractures may be identified without doing so, stripping the pleura allows for a much more detailed examination and may help detect fractures that would otherwise go unnoticed (see the image below). 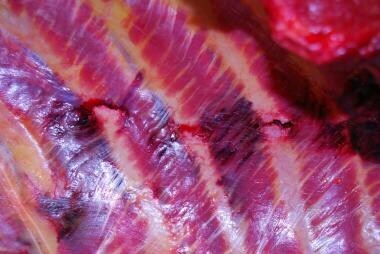 Rib fractures exposed after peeling away the parietal pleura. 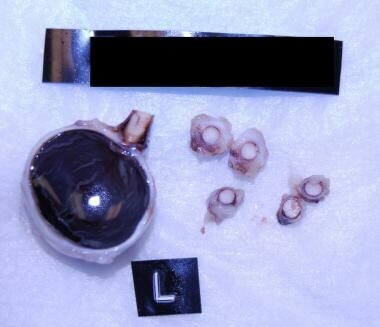 Another procedure often performed in suspected child abuse cases is removal of the ocular globes in order to examine the retinae and optic nerves for foci of hemorrhage. After the brain has been removed, wedge-shaped cuts are made into the anterior fossae in order to remove the orbital plates. Once removed, the eyes may be gently dissected away from the surrounding soft tissues, then placed in formalin (or other fixative) for fixation. 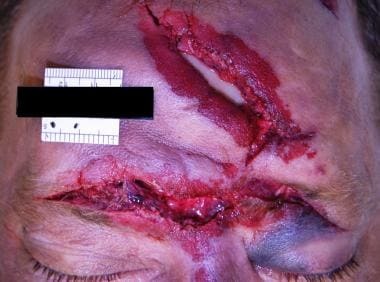 The eyes are later sectioned to examine for hemorrhages; the presence of hemorrhage may be further evidence of blunt force trauma (as shown below). Cross section of the left eye and optic nerve demonstrating hemorrhage surrounding the optic nerve. At the completion of a suspected child abuse autopsy, the pathologist will often make incisions or cutdowns into the skin of the back and extremities to further document injuries to bone and soft tissue. 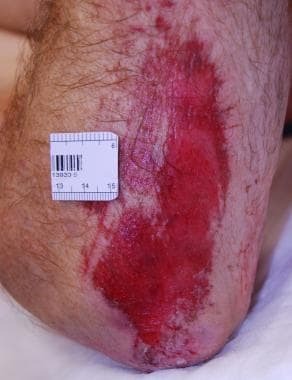 Because of the skin's elasticity, the skin surface may be free of trauma; however, deeper tissues may have been injured. Incisions through the skin may show deep muscular hemorrhage and/or bony fractures (see the following image). Cutdown of the posterior aspect of the left leg showing no injuries. Although the aforementioned procedures may be performed on any decedent, they are most often utilized in child fatalities. Histologic examination is generally not as important as gross impressions in the evaluation of blunt force injuries. Generally, one may examine tissue from a suspected blunt force injury for 2 reasons: (1) to identify a lesion as a true antemortem lesion and (2) to attempt to date a blunt force injury. The presence of significant extravasation of blood into the tissues suggests some degree of blood pressure and, by extension, confirms that a contusion is antemortem. If an inflammatory infiltrate is noted at the site of a blunt force injury, the wound was definitely received before death. The presence of fibroblastic proliferation, hemosiderin deposition, capillary ingrowth, and other histologic features characteristic of repair indicates an injury occurred several days before death. In general, the more repair present, the older the wound. However, dating of blunt force injuries is an inexact science. Both individual and external variables as well as the extent of injury influence the progress of repair. Much has been written in both journals and textbooks about the dating of blunt force injuries; currently, there is no firm, scientific evidence that abrasions and contusions can be dated microscopically with a high degree of accuracy. [1, 2, 4, 5, 6, 7, 8, 9, 10] Although some authorities delineate specific time frames for use in dating each type of injury, in practice, nothing has proved to be any more dependable than gross inspection of the injuries. In most cases of cutaneous and soft tissue injury, the histologic findings should be viewed as an adjunct to the gross impression. There does seem to be some merit in using histology to date fractures, albeit the time frames suggested by histologic examination are general and are not specific to the hour, day, or week. Within 2 days after a fracture has occurred, an acute inflammatory response occurs at the site of the fracture. In the ensuing days, granulation tissue formation occurs. Within approximately 1-2 weeks, new bone and cartilage are deposited. A firm callus with a bony union occurs during weeks 2-6; after this period, no further specific changes occur. [1, 2] Although somewhat general, this dating scheme may be helpful, especially in cases of suspected repetitive child abuse. Measurements and descriptions of blunt force injuries on the skin surface should be documented on a body diagram. Injuries to deeper tissues and internal organs must also be documented either on the same diagram or elsewhere in the case file. When generating the autopsy report, it is often best to divide the description of injuries into subsections for the head and neck, trunk, and extremities. Furthermore, one should describe the injuries "from the outside in." That is, a description of a laceration on the scalp should be followed by that of any deeper scalp hemorrhage, then associated skull fractures, then associated intracranial hemorrhages and any traumatic injuries to the brain. Care should be taken to note whether injuries appear to be acute (recent) or show evidence of healing (resolving). Fractures go through an orderly process of repair that culminates in remodeled bone. 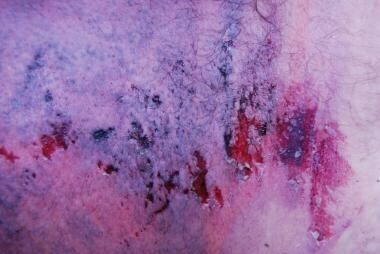 Abrasions first ooze blood, then scab over, then scar or disappear. Contusions may progress from purple to red to green to brown to yellow over a period of weeks, depending on the severity of the injury before complete healing. 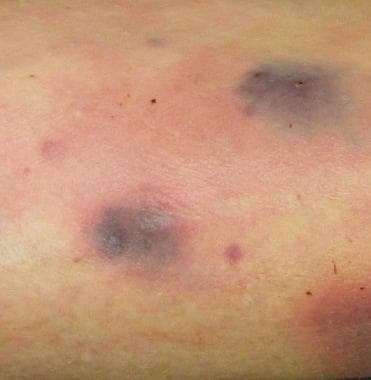 Documentation of the color of contusions may be as important as their configuration and distribution in some cases. As with any forensic autopsy, photography is an integral part of the examination. Appropriate photographs vary according to the individual case and the individual pathologist. They may range from only general overall body photos without detailed photos of injuries in a death resulting from a motor vehicle collision, to much more extensive photography in a death involving suspected child abuse. 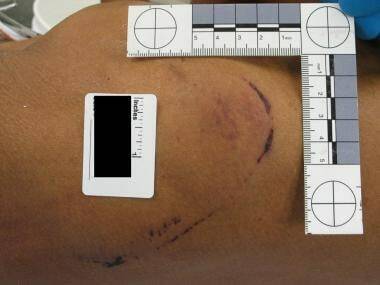 At a minimum, orientation and close-up, scaled photographs should be taken of pertinent injuries in cases of suspected homicides. Most autopsies of deaths resulting from blunt force injuries do not require additional ancillary studies, because the cause and manner of death can be ascertained from the standard autopsy and, when necessary, special dissections. That being said, postmortem radiography is essential in deaths involving suspected child abuse. In such cases, a full body skeletal survey should be performed in order to detect all bony injuries, both acute and remote. Also, if a body is severely burned in a motor vehicle collision or explosion, then radiographs may be warranted to ensure that there are no bullets or other important evidence within the body. Lastly, radiographs of the lower extremities may be useful in hit-and-run pedestrian fatalities to document the presence of "bumper fractures." There are several pitfalls in the evaluation of blunt force trauma or supposed blunt force trauma. Some involve misinterpreting minor or resuscitative injuries as being severe injuries inflicted in the antemortem period; others involve diagnosing blunt force trauma when, in fact, there is no trauma at all. One of the most common errors is confusion and improper usage of the terms "cut" and "laceration." Lacerations are irregular, often abraded, ragged defects in the skin caused by bursting of the skin by compression between an impacting blunt surface and an underlying bony structure. Cuts, also called incised wounds, are clean-edged, sharp force injuries resulting from a sharp edge being sliced across the skin. This distinction is clinically significant as lacerations may be associated with underlying fractures and visceral lacerations or contusions, whereas cuts are not. As previously mentioned, injuries seen on the skin may not be indicative of the force required to cause them. 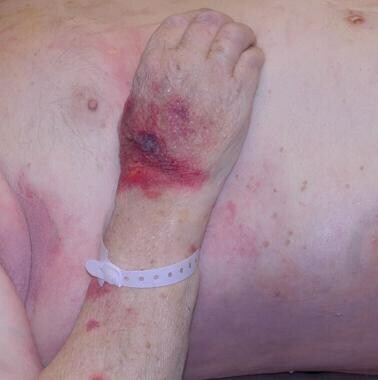 One finding that is often confused with inflicted contusions and/or elder abuse is senile purpura. As individuals age, the skin thins, making it extremely fragile and easy to injure; this thinning of the skin may also occur in conjunction with the use of certain medications, such as steroids. Even very slight trauma such as might be caused by brushing against a door can lead to senile purpura. 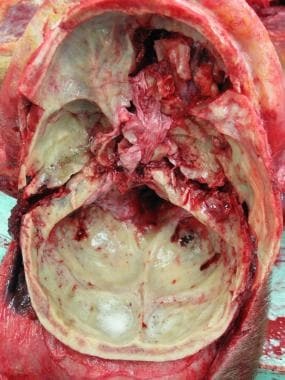 In such instances, there is superficial hemorrhage with little or no extravasation of blood in the underlying tissues (see the following image). Senile purpura on the left arm. Resuscitative efforts may cause injuries to the body that may be confused with injuries that cause death. These iatrogenic artifacts include oral contusions/lacerations resulting from intubation; skin and soft tissue hemorrhage resulting from intravascular catheter placement (see the image below); abrasions resulting from defibrillation; bladder mucosal hemorrhage resulting from the placement of Foley catheters; and rib fractures caused by compression during cardiopulmonary resuscitation (CPR). [11, 12, 13, 2, 14, 15, 16] For this reason, hospital workers, emergency medical care technicians, and other healthcare providers should be advised to leave all medical therapy in place in the event a patient dies. The pathologist can then readily correlate any perimortem injuries with evidence of medical intervention. 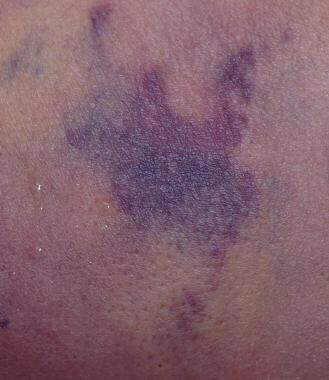 Ecchymosis on the right hand associated with intravascular catheter placement. Rib fractures resulting from CPR are often symmetrical and occur in the anterior or lateral aspects of the ribs; only rarely do they occur in the posterior aspects. Fractures have been noted to occur in up to 30-40% of adults who receive CPR; they occur much more infrequently in children. [11, 12, 13, 15] In addition, aggressive CPR, especially if performed by an inexperienced healthcare provider, may result in injury, including contusions and lacerations, to internal organs. Great care should be taken, however, in blindly accepting a claim that a hepatic laceration with massive internal bleeding was the result of CPR; many, if not all, of these cases are likely to be inflicted, intentional injuries. One finding that an inexperienced pathologist, investigator, or clinician may misinterpret for a contusion is the so-called Mongolian spot. These hyperpigmented spots or patches are most often found on the sacrum of infants, and they occur in people of all races (up to 90% of Native Americans, 80% of Asians, and 10% of whites). Mongolian spots often have a blue-green coloration and are solitary (as seen in the image below); however, these spots may take on various colorations and may be multifocal, even extending up the spine. One must not confuse Mongolian spots with contusions and make a diagnosis of child abuse; if there is any question as to the etiology, the lesion should be incised. A Mongolian spot should have no hemorrhage, whereas with a contusion, hemorrhage will be present in the skin and subcutaneous tissues. Histologically, dendritic melanocytes reside in the dermis creating an appearance similar to that of a blue nevus. Mongolian spot on the buttocks. Periorbital ecchymoses are another finding that one may misinterpret as an inflicted contusion. Though impacts to the nose can cause bilateral periorbital hematomas, most of these ecchymoses or "raccoon eyes" do not result from a direct impact to the skin. Rather they are associated with blood leaking down into the sinuses and periorbital tissues after a basilar skull fracture involving the orbital roofs (see the following image). Postmortem changes on the chest caused by insect activity. Postmortem changes on the left ankle caused by insect activity. A common question from lawyers and other interested parties is whether a particular surface or weapon could have caused the injuries seen at autopsy. When a patterned contusion and/or abrasion has been identified, it may be possible to match a weapon to the inflicted injuries; however, most of the time, this is not the case. Most blunt force injuries are nonspecific and may be caused by an impact by any number of objects. When approached with this line of questioning, it is best to acknowledge that the weapon in question could have caused the injuries (if this is indeed true) but not to definitively say that the weapon did cause the injuries. Although this may sound like wordsmithery, it could have a profound effect on a trial. For instance, a laceration on the head caused by a piece of lumber could appear identical to a laceration caused by a bat, a computer monitor, or various other objects. Therefore, one would not want to be cornered into saying that an injury could only been have caused by one such object (eg, a bat), when in reality it was caused by a bloody piece of lumber found at the scene. It may be most honest to say that "this type of weapon could (or could not) have caused the injuries noted at autopsy" and to be ready to discuss alternatives when questioned at cross-examination. In a courtroom trial, one may be asked to specify the date on which a blunt force injury occurred. As previously mentioned, the age of contusions and abrasions occur can only be determined in a general manner. One practical approach is to consider contusions acute or recent (if they are purple/red/blue and show no histologic repair) versus resolving (if they are yellow/green/brown/gray and show histologic repair). The dates on which fractures occur can be determined somewhat more specifically but should not be dated to the minute, hour, or even day. A similar classification (acute or recent vs resolving) scheme may be used for abrasions. Again, one should not allow oneself to be forced into testifying to a specific time of injury unless there is other evidence (eg, witness accounts, video) that correlates with the autopsy findings; doing so could compromise one's entire testimony and stretch the limits of scientific certainty. DiMaio VJ, DiMaio D. Blunt trauma wounds and blunt trauma injuries of the trunk and extremities. Forensic Pathology. 2nd ed. Boca Raton, Fla: CRC Press; 2001. Chapters 4-5. Dolinak D, Matshes EW, Lew EO. Blunt force injury. Forensic Pathology: Principles and Practice. Burlington, Mass: Elsevier; 2005. Chapter 5. Spitz WU, Spitz DJ, eds. Blunt force injury. Spitz and Fisher's Medicolegal Investigation of Death: Guidelines for the Application of Pathology to Crime Investigation. 4th ed. Springfield, Ill: Charles C Thomas; 2006. Chapter 10. Friede RC, ed. Blunt force injury. Handbook of Forensic Pathology. 2nd ed. Northfield, Ill: College of American Pathologists; 2003. Chapter 14. Byard RW, Wick R, Gilbert JD, Donald T. Histologic dating of bruises in moribund infants and young children. Forensic Sci Med Pathol. 2008. 4(3):187-92. [Medline]. Klotzbach H, Delling G, Richter E, Sperhake JP, Puschel K. Post-mortem diagnosis and age estimation of infants' fractures. Int J Legal Med. 2003 Apr. 117(2):82-9. [Medline]. Robertson I. Antemortem and postmortem bruises on the skin: their differentiation. J Forensic Med. 1957. 4:2-10. Robertson I, Hodge PR. Histopathology of healing abrasions. Forensic Sci. 1972 Apr. 1(1):17-25. [Medline]. Vanezis P. Interpreting bruises at necropsy. J Clin Pathol. 2001 May. 54(5):348-55. [Medline]. Black CJ, Busuttil A, Robertson C. Chest wall injuries following cardiopulmonary resuscitation. Resuscitation. 2004 Dec. 63(3):339-43. [Medline]. Buschmann CT, Tsokos M. Frequent and rare complications of resuscitation attempts. Intensive Care Med. 2009 Mar. 35(3):397-404. [Medline]. Dolinak D. Rib fractures in infants due to cardiopulmonary resuscitation efforts. Am J Forensic Med Pathol. 2007 Jun. 28(2):107-10. [Medline]. Hashimoto Y, Moriya F, Furumiya J. Forensic aspects of complications resulting from cardiopulmonary resuscitation. Leg Med (Tokyo). 2007 Mar. 9(2):94-9. [Medline]. Maguire S, Mann M, John N, et al. Does cardiopulmonary resuscitation cause rib fractures in children? A systematic review. Child Abuse Negl. 2006 Jul. 30(7):739-51. [Medline]. Monsuez JJ, Charniot JC, Veilhan LA, et al. Subcapsular liver haematoma after cardiopulmonary resuscitation by untrained personnel. Resuscitation. 2007 May. 73(2):314-7. [Medline]. Kibbi A-G, Tannous Z, Kurban M, Bahhady RF, Harb DI. Mongolian Spot. Medscape Drugs & Diseases from WebMD. Available at http://emedicine.medscape.com/article/1068732-overview. Updated November 11,2015; Accessed: March 2, 2016. Spagnoli L, Amadasi A, Frustaci M, Mazzarelli D, Porta D, Cattaneo C. Characteristics and time-dependence of cut marks and blunt force fractures on costal cartilages: an experimental study. Forensic Sci Med Pathol. 2016 Jan 12. [Medline]. Reber SL, Simmons T. Interpreting injury mechanisms of blunt force trauma from butterfly fracture formation. J Forensic Sci. 2015 Aug 20. [Medline].